This is the fairy tale of Beauty and the Beast with twists, darkness and a love so meant to be that all you will be wishing all other fairy tales could be made into adult form. A night could change everything. The only thing Reno Sundown has ever known is pain. How to take it and how to use it. He was created that way and once his purpose was done, he was locked away. Never had he known good, laughter, love until he met her. Emma Devenmore has always focused on one thing, family. The eldest of her sisters, she has made life centered on protection. Protecting her family and doing her job of protecting others. A love story was never in her plans, until she met him. By chance, their paths cross and both were forever changed. A Beauty left yearning for a Beast, who had opened her up to something she had never dreamed of. A Beast left wanting for a Beauty, who had unlocked emotions he never knew possible, and never was supposed to know existed. Once paths are crossed, can they ever be uncrossed? Once they are crossed, are they destined to grow together? Or can they only be consumed by complete Madness? A Sweetly Dark, Twisted Re-Telling of Beauty and the Beast A night could change everything. Consume a cold heart in heat… Open a heart that has been closed… Intertwine two lives for a lifetime…and beyond. The only thing Reno Sundown has ever known is pain. How to take it and how to use it. He was created that way and once his purpose was done, he was locked away. Never had he known good, laughter, love until he met her. Emma Devenmore has always focused on one thing, family. The eldest of her sisters, she has made life centered on protection. Protecting her family and doing her job of protecting others. A love story was never in her plans, until she met him. By chance, their paths cross and both were forever changed. A Beauty left yearning for a Beast, who had opened her up to something she had never dreamed of. A Beast left wanting for a Beauty, who had unlocked emotions he never knew possible, and never was supposed to know existed. Once paths are crossed, can they ever be uncrossed? Once they are crossed, are they destined to grow together? Or can they only be consumed by total Madness? ...a good book resonates and leaves you a bit sad when you realize it's over and you're forced to return to the "real" world. A great book, however, leaves you looking around and wondering how the hells the world around you is ever going to be the same again after all you just lived through, thanks to the author. 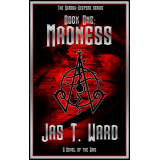 "Madness" is that book. And it's coming soon.